Media Library / Bible Study Guides / Who is the Antichrist? 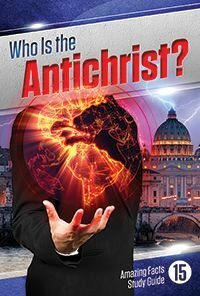 Who ... or what ... is the antichrist? Evil alliance—or sinister individual? Some say his appearance is still in the future. Others say he appeared long ago in the days of ancient Rome. But the Bible indicates that he is alive today! 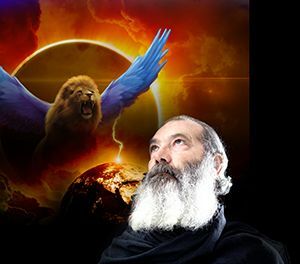 Bible prophecies teach that this antichrist power will play a crucial role in the final events of earth’s history. Do you know who he is? Are you sure? You need to be, for you can’t understand last-day events until you understand this evil power. Be prepared for one of the most intriguing Study Guides yet! This Study Guide is based on the book of Daniel chapter 7 and clearly and unmistakably identifies the antichrist. But it is only an introduction. Future lessons will reveal details of some of his activities that will have worldwide impact. What you discover today may displease or sadden you, but please remember that the prophecy of Daniel 7 comes from Jesus, who loves you. Pray for God’s guidance as you delve into this urgent subject. Be sure to read Daniel 7 before studying this lesson. 1. As chapter 7 begins, Daniel sees four beasts coming up out of the sea. In prophecy, what does a beast represent? What does the sea represent? 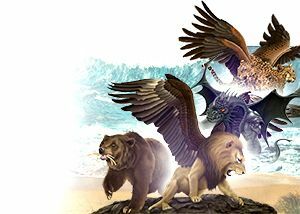 “The fourth beast shall be a fourth kingdom on earth” (Daniel 7:23). “The waters ... are peoples, multitudes, nations, and tongues” (Revelation 17:15). 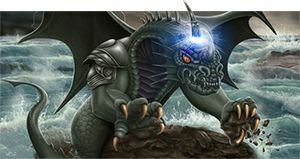 Answer: A beast represents a kingdom or nation. Water represents multitudes of people or large populations. 2. 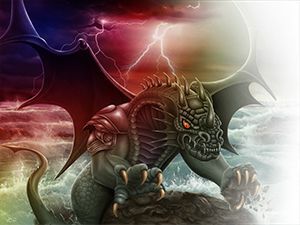 The four beasts of Daniel 7 represent four kingdoms (verses 17, 18). Babylon, the first kingdom (Daniel 2:38, 39), is represented as a lion in Daniel 7:4. (See also Jeremiah 4:7; 50:17, 43, 44.) What do the “eagle’s wings” mean? What do the “four winds” of verse 2 represent? “The Lord will bring a nation against you ... as swift as the eagle flies” (Deuteronomy 28:49). “Says the Lord of hosts: ... a great whirlwind shall be raised up from the farthest parts of the earth. And ... the slain of the Lord shall be from one end of the earth even to the other end of the earth” (Jeremiah 25:32, 33). 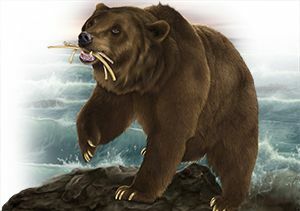 The bear with three ribs in its mouth symbolizes Medo-Persia. Answer: Read Daniel 8. Notice that the beasts in chapter 8 parallel those in chapter 7. Daniel 8:20 specifically names Medo-Persia as the kingdom that precedes the male goat—that is, Greece—of verse 21. Medo-Persia is the second kingdom—the same power as the bear of Daniel 7. The empire was made up of two groups of people. The Medes came up first (represented in Daniel 7:5 by the bear raising up on one side), but the Persians eventually became stronger (represented in Daniel 8:3 by the ram’s second horn that grew “higher”). The three ribs represent the three principal powers conquered by Medo-Persia: Lydia, Babylon, and Egypt. 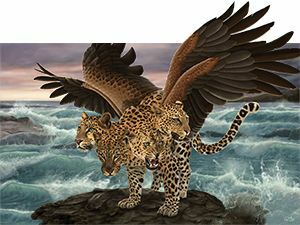 The leopard beast of Daniel 7 represents the world kingdom of Greece. 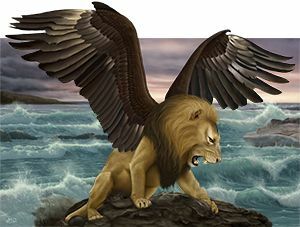 Answer: The four wings (instead of two, as the lion had) represent the incredible speed with which Alexander conquered the region (Jeremiah 4:11–13). The four heads represent the four kingdoms into which the empire of Alexander the Great was divided when he died. The four generals who headed these areas were Cassander, Lysimachus, Ptolemy, and Seleucus. The world empire of Rome is symbolized by the monster beast of Daniel chapter 7. The little horn of Daniel 7:8 represents Antichrist. “I was considering the horns, and there was another horn, a little one, coming up among them, before whom three of the first horns were plucked out by the roots. And there, in this horn, were eyes like the eyes of a man, and a mouth speaking pompous words” (Daniel 7:8). G. God’s people (the saints) would “be given into his hand” for “a time and times and half a time” (Daniel 7:25). I. It would “intend to change times and law” (Daniel 7:25). A. It came up among the 10 kingdoms of Western Europe. The emperors of Western Europe were largely Catholic and supported the papacy. Three Arian kingdoms, however, did not—the Vandals, Heruli, and Ostrogoths. So the Catholic emperors decided they must be subdued or destroyed. Here is how theologian and historian Dr. Mervyn Maxwell describes the results in volume 1, page 129, of his book God Cares: “The Catholic emperor Zeno (474–491) arranged a treaty with the Ostrogoths in 487, which resulted in the eradication of the kingdom of the Arian Heruls in 493. And the Catholic emperor Justinian (527–565) exterminated the Arian Vandals in 534 and significantly broke the power of the Arian Ostrogoths in 538. Thus were Daniel’s three horns—the Heruls, the Vandals, and the Ostrogoths—‘plucked up by the roots.’ ” It is not difficult to recognize that the papacy fits this point. The papacy clearly fits this description, as it came on the scene as a religious power and was different from the secular nature of the other 10 kingdoms. Lest anyone should think that we are attacking fellow Christians by identifying the little horn power, please keep in mind that the prophecy is aimed at a system and not individuals. There are sincere, devout Christians in all churches, including the Catholic faith. Daniel 7 is simply a message of judgment and correction upon a large religious institution that compromised with paganism, as many other churches have also done. 5. The rule of the papacy began in ad 538, when the last of the three opposing Arian kingdoms was uprooted. Its rule continued until 1798 when Napoleon’s general, Berthier, took the pope captive with hopes of destroying both Pope Pius VI and the political power of the papacy. This period of time is an exact fulfillment of the 1,260-year prophecy. The blow was a deadly wound for the papacy, but that wound began to heal and continues healing today. 6. This same period of persecution is mentioned in Matthew 24:21 as the worst period of persecution God’s people experience. Verse 22 tells us it was so devastating that not one soul would have survived if God had not shortened it. But God did shorten it. The persecution ended long before the pope was taken captive in 1798. It is plain to see that this point, likewise, fits the papacy. H. It would speak "pompous words" of blasphemy "against [God]." The angel told Daniel that the prophecies of this book would be sealed until 1798, the time of the end. 9. Wasn’t Daniel told to seal up his book “until the time of the end” (Daniel 12:4)? When will Daniel’s prophecies be opened to our understanding? All religious teachings must be compared with Scripture to determine their accuracy. 11. 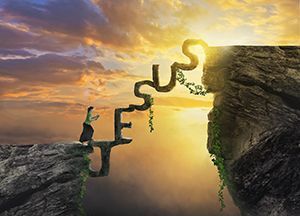 Are you willing to follow where Jesus leads, even though it might be painful? C. Clearly reveal Satan’s sinister plans to ensnare and destroy us all. D. Present the security and love of the judgment; God’s saints will be vindicated! 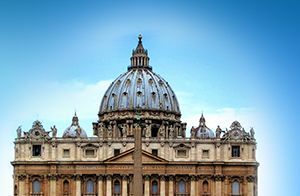 This Study Guide has presented evidence that the antichrist is an organization—the papacy. The words “eyes of a man” in Daniel 7:8, however, do point to a leader. Revelation 13:18 speaks of a man with a number being involved. In Daniel 8, Greece is represented by a goat and its leader, Alexander the Great, is symbolized by a horn. The same is true of antichrist. The organization is the papacy. The pope in office is its representative. The prophecy of Daniel 7 is not saying that popes are evil and that Catholics are not Christians. There are many warm, loving Catholic Christians. The system, however, is called antichrist because it has attempted to usurp Jesus’ authority and attempted to change His law. No. 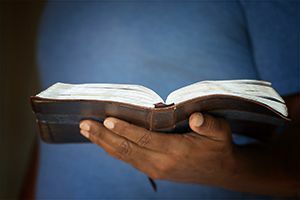 The Bible is clear that all should have freedom to choose the direction they wish to go in matters of conscience (Joshua 24:15)—even if they choose to deny God. The Creator permitted Adam and Eve to choose to disobey even though it hurt both them and Him. Forced worship is not acceptable to God. Forced worship is the devil’s way. God’s way is loving persuasion. History shows that virtually every time the church passed laws to enforce its beliefs, persecution and murder of others resulted. This is a lesson we can learn from the history of the little horn during the Middle Ages. A. 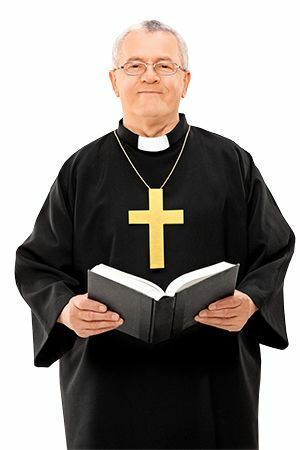 Its priests can forgive sins—which only God can do (Luke 5:21). Satan’s original plan was to assume God’s position and authority. His aim was to oust God and rule in His place. (See Study Guide 2.) When Satan was ejected from heaven, his aim did not change but rather intensified. Through the centuries he has endeavored, using various human agencies, to discredit God and take over His position. Not at all. God uses the symbolism of a beast to signify a ruler, nation, government, or kingdom. It is His way of depicting governments in prophecy. We do this ourselves to some degree: We have depicted Russia as a bear, the United States as an eagle, etc. The symbol “beast” is not a demeaning, disrespectful term. It is synonymous with “animal” or “creature.” Even Christ is portrayed as a lamb by John the Baptist (John 1:29) and the apostle John (Revelation 5:6, 9, 12, 13). The term “beast” is utilized by God to give us a message about nations and leaders—good and evil. _____ One of Babylon's generals. _____ It would persecute God's people. 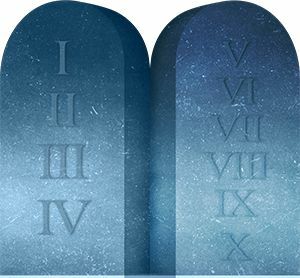 _____ It attempted to change God's law.